Hello everyone! Today is Day 3 of my Growing in Unity Week. Unity Stamp Company is just the best--they always have great sales, include free gifts in your order, have great customer service, and give people opportunities like this! For my card today I used Let Your Dreams Bloom. It's one of my favorite sets that I have used before. 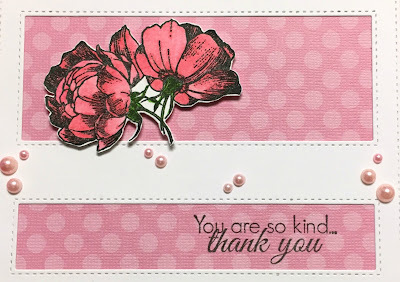 I just love the flowers and all the sentiments that come in the set. I used my Zig Clean Color markers to color this. I am really trying to work on shading and not just have one straight color on the whole thing. That's why I love to be a GIU gal--I really take the time to color my Unity Stamps. Be sure to leave a comment for your chance to win 25 random stamps! I will pick two winners. Wow!! This card is stunning! Love the colors and the layout. Oh, how pretty. I love the flowers......nice coordination. Gorgeous card Helen! Love the pink and the stitched frame! Erykah nice. Never would of thought of that kind of layout. I will have to try. This is a beautiful card! I'm enjoying seeing all of your creations! Beautiful card!! I love it. So beautiful!! Love that flower and the added pearls are perfect! Stunning card! I love the layout... it highlights the flower and sentiment beautifully! Very pretty!. Happy to share with you this week for Growing In Unity. Your card is so beautiful, Helen! What a beautiful card! I think your coloring/shading is amazing! Beautiful job on it, and on the layout of the card. Flowers are beautiful. The pearls are a perfect touch! I like that die too! What one is it? I love the shading...that's something I need to start learning. Beautiful card! It's MFT Stamps Stitched Cover-up Companion Horizontal. Very pretty coloring! Gorgeous design. Gosh, this card is beautiful! I love the design and your coloring is wonderful. This is a very pretty card. I love the simplicity. Your pearl placement is unique and inspiring. So well balanced and pleasing to look at...I kept scrolling back up because I had to see it again and again! Well done Helen! I love those pretty pink pearls. Oh how Pretty Helen! LOVE the flowers... beautiful! Beautiful card! Love the way you've made the combination of the stamps and dsp. Such a soft, elegant card. I really like the way unusual placement of the pearls. Love this card! It is really unique and pretty!